I don’t usually begin interviews with a synopsis and a trailer, but for this one I think I must, to give you an idea about what Faiza Ahmad Khan’s Supermen of Malegaon is all about. 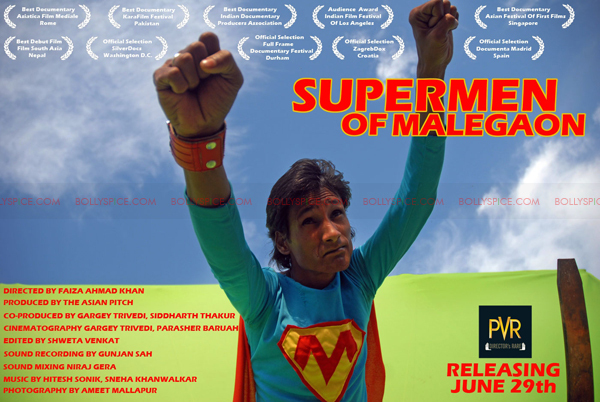 Supermen of Malegaon has captured audiences’s hearts the world over and received outstanding reviews and been honored with numerous awards from prestigious film festivals in Rome, US, Singapore, Romanina, and Stuttgart to name a few. It also has recently had a very limited release in India through PVR’s initiative called ‘Director’s Rare’ and those who have seen it can’t stop raving about how good it is. We were able to catch the director for an email interview and she gave us some wonderful insight into the making of this magical film. Now over to Ms. Faiza Ahmad Khan and the world of Supermen of Malegaon. Tell us about the film Supermen of Malegaon came to be. As with most things, you start with a central image or an idea. In this case, a thriving film industry in Malegaon, which in itself is an intriguing statement and made us want to know more. But the thing about documentaries is, much like life, once you make the journey across to where you think you’re going, you find that you’ve arrived someplace else. Like one of the people says in the film, he’s been trying to get to Bombay for fifteen years, but it always seems like Bombay is moving further away. We got to Malegaon hoping to capture the local industry making a film. Instead, we discovered a series of characters who were compelling, very human, brave and funny at the same time. So, suddenly, this film industry in the hinterland is populated by fascinating people. And then you start to uncover the strange dynamic of the place. The power looms that have been crippled by the twelve hour power cuts. An economy and a town in tatters. A place that is obsessed with cinema; it is the only real entertainment, and people will queue for hours to get into cinemas and video halls, where they play old movies, dubbed movies, strange B and C international releases. A place with a history of communal violence. Hindu and Muslim populations neatly divided by the river that flows through the center of the town. A thriving film industry run solely by the Muslim population. A strict policy about not letting local women work in those films. And all of it located in this forbidding, half-surreal landscape. 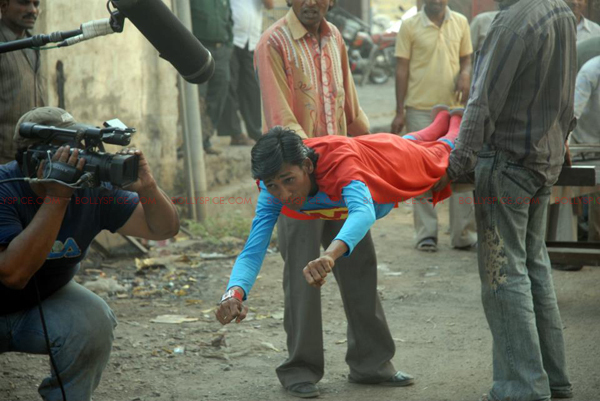 So then the film became about capturing these Supermen in this Malegaon. 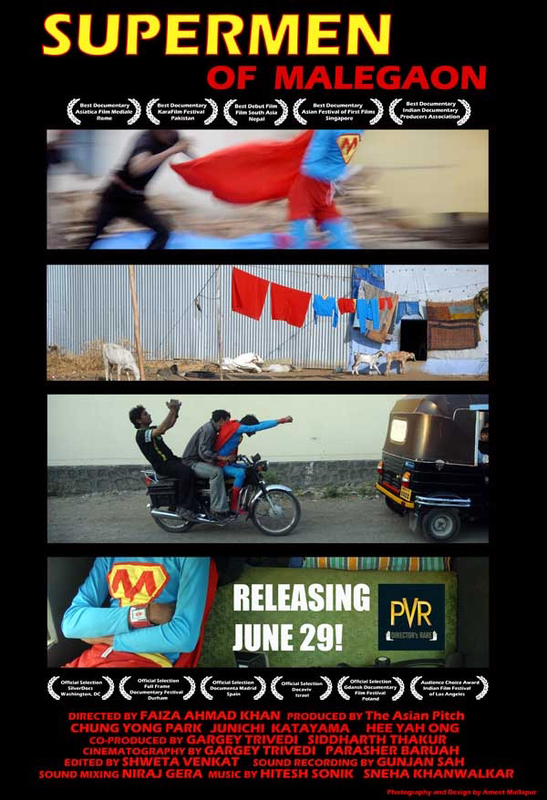 Supermen of Malegaon is a documentary film that follows a group of intrepid filmmakers in Malegaon, Maharashtra as they attempt to make Malegaon ka Superman; transposing the Man of Steel onto the landscape of a town known for its power looms and power cuts, and its communal riots. While the idea was to record this astonishing journey from a dream to a finished film, it also a record of the people trying to make the film, and of Malegaon itself, and their hopes and their fears, and the charm and grace with which they live their lives. When you first came upon the subject, what were your thoughts about the films and the people of Malegaon? Most of the population of Malegaon is crazy about cinema. With a crippled economy and twelve-hour power-cuts every day, films have become the principal way to pass the time. There are twelve cinema halls and twice as many video halls. There are fan-clubs everywhere. On Fridays, after the Jumma namaaz, there is a stampede outside the theatres. The old Agneepath, starring Mithun and Amitabh Bachchan, is still a favourite and still plays regularly in Malegaon. In the middle of this, about twelve years ago, Nasir – who used to shoot and still shoots wedding videos, and used to run a video parlor – finally decided that he needed to make a film. He picked the biggest hit of all time, Sholay. Made on a budget of 50,000 rupees, the film was a massive hit in Malegaon – it ran houseful shows for a long time. The famous robbery sequence was done with dacoits on bicycles trying to rob a bus. And it kind of set the template for the work that has followed. The film industry in Malegaon is a cottage industry, and these are handmade films, done on ridiculously low budgets, localized to Malegaon, about things and films that people dreamt up in their free time. As a result, there is an extraordinary degree of innovation – cycles used for tracking shots and bullock carts for crane shots. But the greatest trick the Malegaon filmmakers employ is their street-smart transposition of these famous films to local situations and problems. And now are many groups, with fluid and constantly changing crews, who continue to make these films. Give us some insight into how the film was made. I had just finished assisting on a feature film and seen first-hand just what it cost the director on that project, to simply get that film on the floor. And I heard about these people in this town, sort of in the middle of nowhere, who make films for the sole reason that they love cinema. We didn’t go in with a set script. There were a few basic guidelines – the idea was to largely observe the process, the idea was to be a fly on the wall. We were going to document the filmmaking process and the lives of the people making that film. We had to find our own rhythm as a working unit under adverse conditions. We had to earn the trust of our subjects. We had to resist the temptation to help out with their film, because that would have altered the experience. It became a little difficult for us to decide what to shoot and what not to shoot, because there was so much happening around the film and the people we were filming with. So we shot as much of it as we could. By the end of the shoot, we had about 250 hours of footage. And then we had to go back in and find the story we wanted to tell while editing the film, through all those hours of footage, going back and forth with a few trusted opinions, shaping, pruning, destroying, building again. All the while, trying to stay true to the nature of what we had witnessed, trying to capture and retain what we all regarding as such a fundamentally brave act. We had to edit those 250 hours down to a 52 min film. And we had a deadline that was two months away. Enter Shweta Venkat… Superwoman editor! What was it like to shoot a film about making films? The other film crew thought we’d leave in three or four days, perhaps like a news crew or something. But we hung around for three months. And we were not only filming the filmmaking process, but their lives as well. 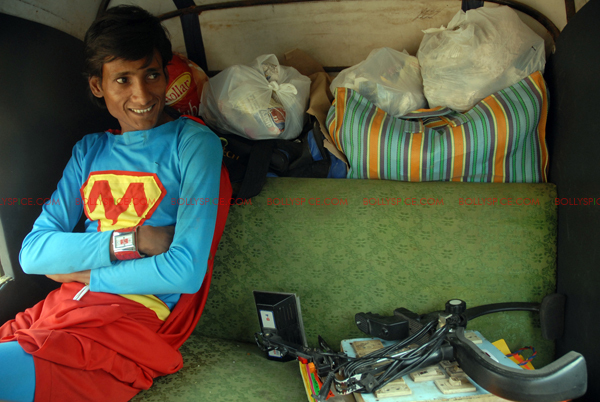 So we’d be there, at Nasir’s – the director of Malegaon Ka Superman – house every morning, with our cameras. At some point, he even got a little exasperated with us. But he understood, maybe as a film maker himself, that we needed to do this if we were to get under the skin of the city to better understand the men who from that city who would push themselves so hard for something that seemed sort of trivial at first. I’m glad that we moved beyond that, beyond his initial exasperation, because that was when so many things started to become accessible to us. And we also spent a lot of time there, under fairly unusual circumstances. We became as much part of their process of making the film. Eventually, it led to a rapport and that enabled us to exist like flies on the wall. What amazed you most about the films of Malegaon? Well, as I mentioned, the central idea opened up a world of its own. And beyond that, what’s happening in Malegaon is very interesting at a sociological level. Because this isn’t about people simply trying to ape Bollywood. They take these templates from well-known films and turn them on their heads to try and engage with problems that are particular to Malegaon. So, at one point, Superman has to fly upwards because the cell-phone reception in Malegaon is so bad. And he falls ill because the pollution is so bad. The villain is obsessed with dirt and filth, because that is what ails their world. These films are enormously successful, they’re hits with their target audiences, and yet they’re funny, vivid and come from a unique viewpoint. And everyone who heard about the idea before we went over to film the documentary was very intrigued about the premise. And everyone who watched the film eventually reacted to this absurd, good-humored sense of bravery that seems to be the biggest take-home from our film. You would think that capturing a group of men trying to make a film in Malegaon would largely be comic. Instead, what we saw and hopefully were able to capture, was a very moving experience. We watched them as they fought past this bad hand that life and the State has dealt them. Nothing fazed them. Not the idea, the scale, the ambition, their backgrounds, the stunning lack of resources. They found a way past everything. And, of course, once we discovered that they had moved beyond Bollywood and were ready to take on Hollywood, that they had set their eyes on Superman, the idea was just irresistible. What do they try to do with their films? The Mollywood films are not about people simply trying to ape Bollywood. They take these templates from well-known films and turn them on their heads to try and engage with problems that are particular to Malegaon. It is such an amazing subject, what did you all learn on your path to making this film? One glaring thing about Malegaon is how women are absent from public life and from their films. Only men watch films in cinemas. Only men make films. There is absolute refusal to allow any women from Malegaon to work in these films. Of course it has a lot to do with it being a Muslim community that is not very liberal when it comes to women, but it raises a whole host of uncomfortable questions about the perception of women in cinema that fosters that kind of thinking. Actress in Malegaon films are brought in from outside Malegaon. For this film, the actress was brought in from Dhulia for two days. The script, all the way back in pre-production, was written with this in mind. So, the actress is never required for more than two days so as to keep costs down. That was the only point during this process that I found myself incapable of not interfering. And Nasir and I ended up having a fight about this very issue. You brought together quite an impressive crew, tell us about who worked on the film and how they became part of the project? Siddharth, my co-producer, and I went to Malegaon and met Nasir – the director of Malegaon ka Superman – and his gang of collaborators. These are all people who have day-jobs, all these mundane things they do to put food on the table. And, in their free time, they dream of making films. And then they make them. On the way we speculated that if there was a film that we might want to see these fantastic real-life characters make, then Superman would top that list. In the first ten minutes of our meeting Nasir said that there was a film that he wanted to make and that film was Malegaon ka Superman. The signs were all pointing in one direction. And we were on. We came back to Bombay. Mentioned the idea and the experience to a friend who told his friend, Gargey Trivedi, who in turn came on board as co-producer and we pitched it to the Asian Pitch in Singapore, which is a collaboration of three TV networks in Asia- Mediacorp, KBS and NHK. They loved the idea, we won the pitch and got full funding. In literally two weeks, from being just an idea in my head, we had funding for the film. And a month later, we were in Malegaon, filming. Parasher Baruah along with Gargey shot the film. Gargey later shot My Friend Pinto. We came back with 250 hours of footage and a month and a half to edit it. 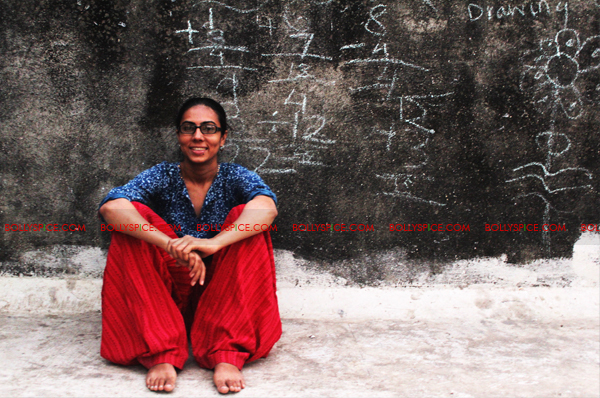 Enter Superwoman, Shweta Venkat. Supremely talented, she put the film together and how! SHe went on to edit Gangs of Wasseypur. Then stepped in Sneha Khanwalkar and Hitesh Sonik who did music for the film. Niraj Gera did the final sound mix. What do you think it is about cinema that brings so much to people? In Malegaon, it’s pure escapism. Largely the population there works in the powerlooms. The economy was in the dumps. With eight hour power cuts, the workers were earning much less. And so on Friday which was a holiday, after the Friday prayers, they’d go to a theatre and escape into the fantastical world of cinema. What did they think of your film about their films? They’ve had many people come and do short news stories about their filmmaking. With Superman they really appreciated the expanse of the film…that it was not just about how they made their films but also about their lives, and the town. 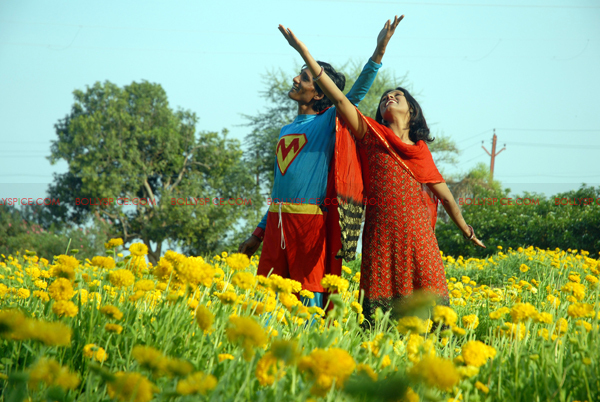 This film has been seen and praised the world over, tell us about taking Supermen of Malegaon to the festivals. The film was primarily made for a television channel in Singapore and we never anticipated it to go beyond that. But we got a last minute screening at the Film Market in France with only six people attending it. There was an Italian journalist amongst them who took the film back to Rome. The Asiatica Film Mediale in Rome was the first festival that the movie went to and won the Best Documentary award there. Since then the film has won about 15 awards and has been to over 35 festivals. It has been quite the struggle to get the film released in India, tell us about that. The Marketing head at PVR had seen the film two years ago and wanted to release the film through PVR. But we did not have distribution rights then so we could not release the film. This year in January we acquired the rights and PVR launched this initiative called ‘Director’s Rare’, under which they release indie films. I know the people the film have some expectations from the release of the film and I hope things work out for them in the way they want. Some of them want to come and work in Bollywood. Farogh Jafri who is a writer has been wanting to come to Bombay for the last 15 years. I hope the film will help him reach his destination. What do you think is the most amazing thing about the Supermen of Malegaon? Their unadulterated passion, their defiance of their circumstances and their ability and dream and do. What will audiences take away with them after seeing Supermen of Malegaon? Someone said after watching the film: ‘If you are about to give up on your dream, watch Supermen of Malegaon’. 16 queries in 0.664 seconds.